Fifteen hours after boarding sleeper bus number two, Gin Rummy card games, “two truths and a lie” silliness and eventual sleep, we arrived in Danang. Although it apparently has an amazing beach, it was really chilly and the town didn’t impress us, so within 24 hours we jumped on a train heading north. But, as good tourists, we didn’t waste our 24 hours. 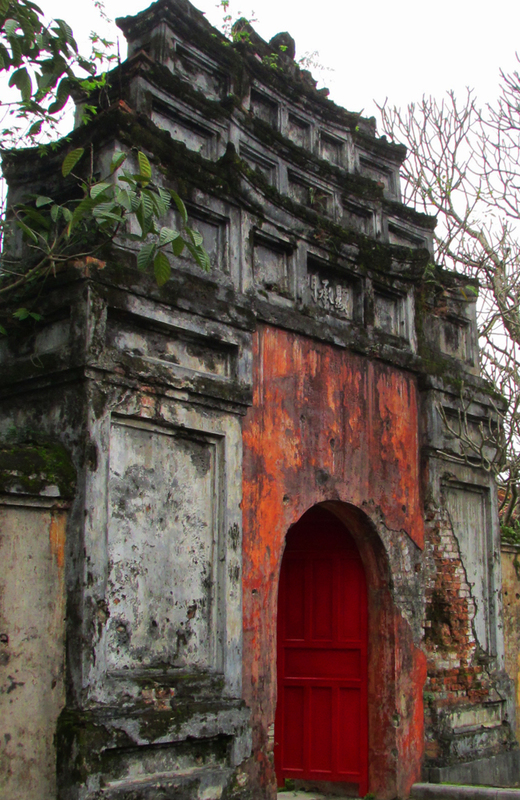 Marble mountain: “A cluster of five limestone and marble outcrops, famous for their grottoes, pagodas and role as a Viet Cong redoubt during the Vietnam War. The peaks yield sweeping views of the strand American soldiers dubbed China Beach.” ~ National Geographic Traveler guide book. 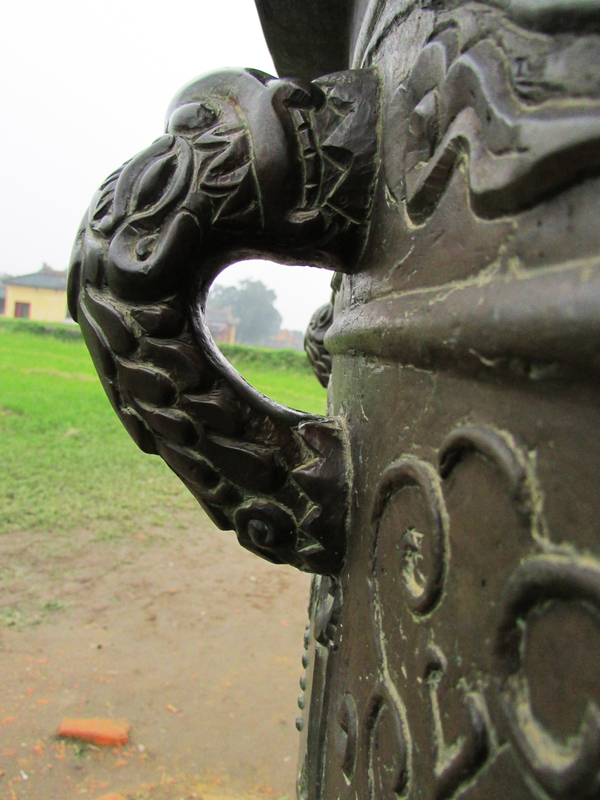 First we walked through a 500 year old stone cutters village with huge marble statues from Buddhas to Christian saints to lovers and all sorts of massive animals. 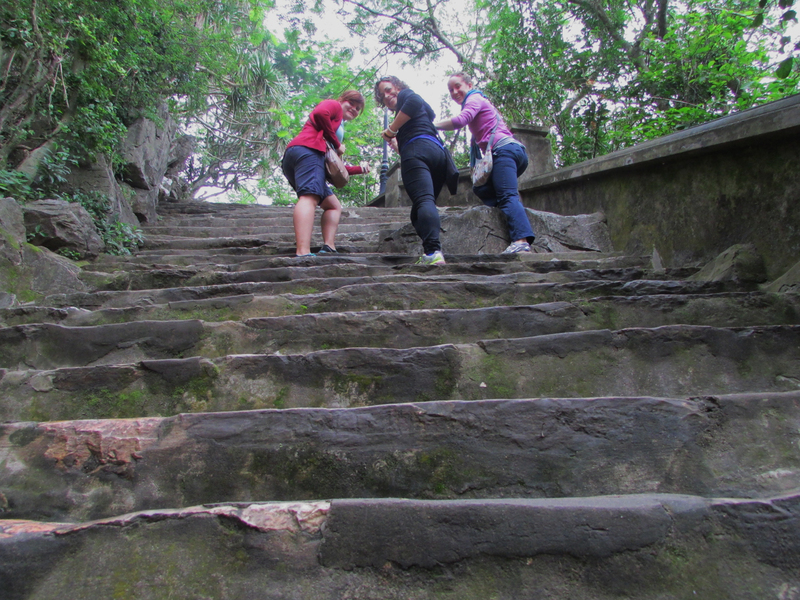 Then we climbed 156 really steep steps up, up, up. 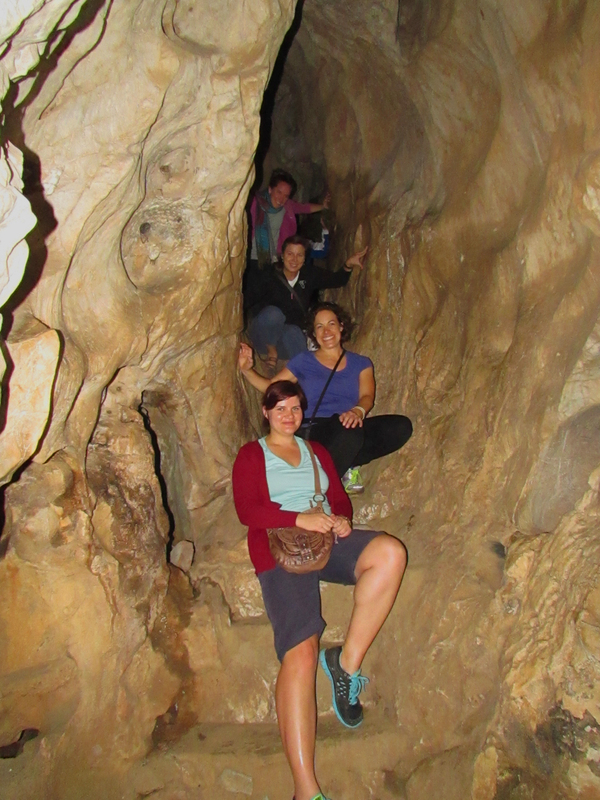 We hiked all over the top, through caves, chatted with the incense vendor ladies and gave prayers at the Tam Thai Pagoda. 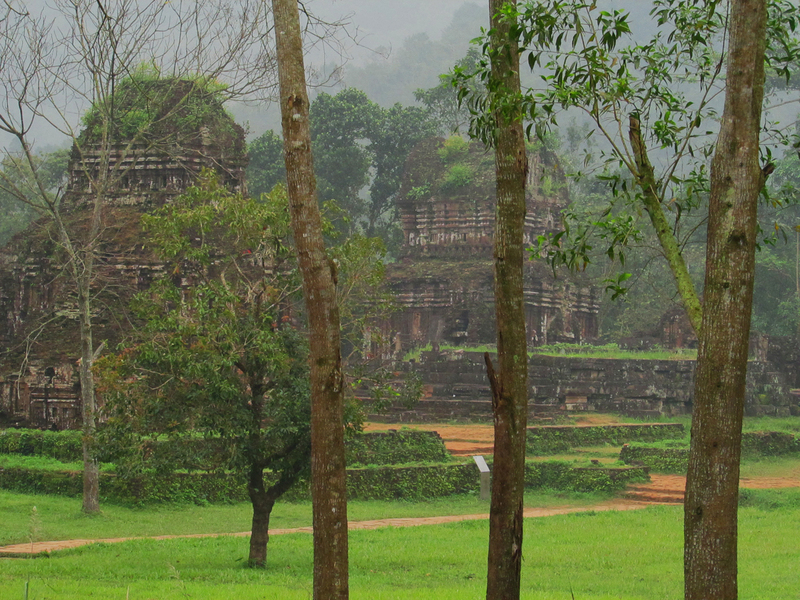 Then we headed over to My Son ruins, a UNESCO World Heritage site. 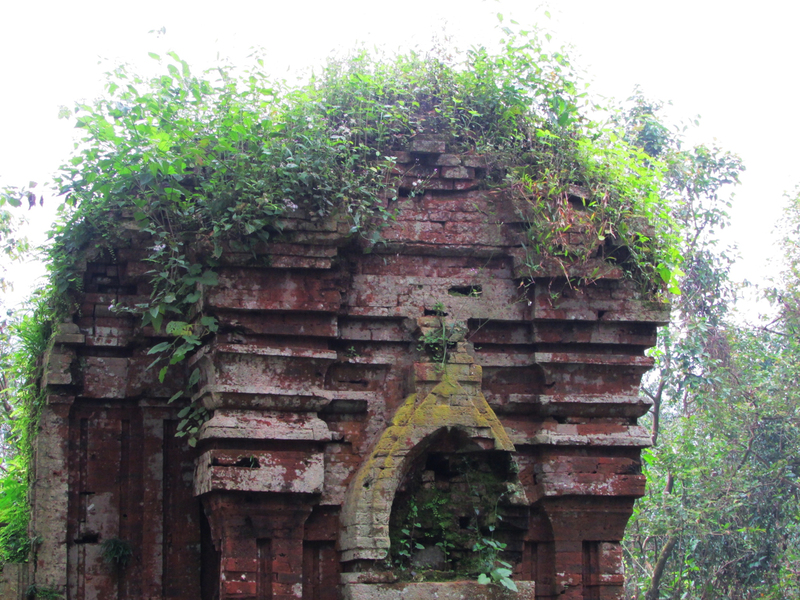 This is a 1,500 year old, brick-built temples complex discovered amidst the jungle by the French in 1898. 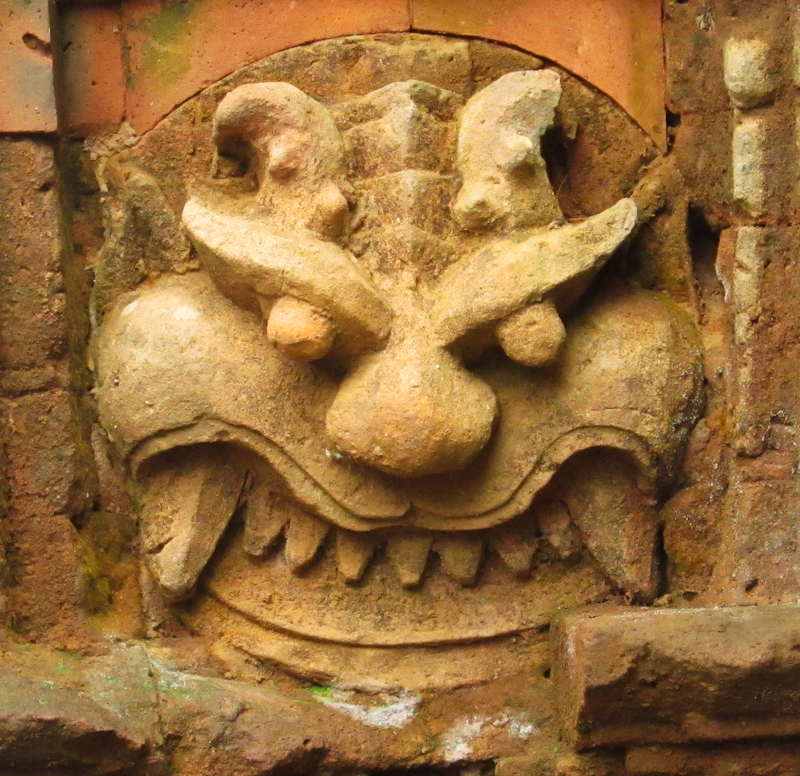 From the 4th to the 14th century, each new Cham king built at least one temple here. 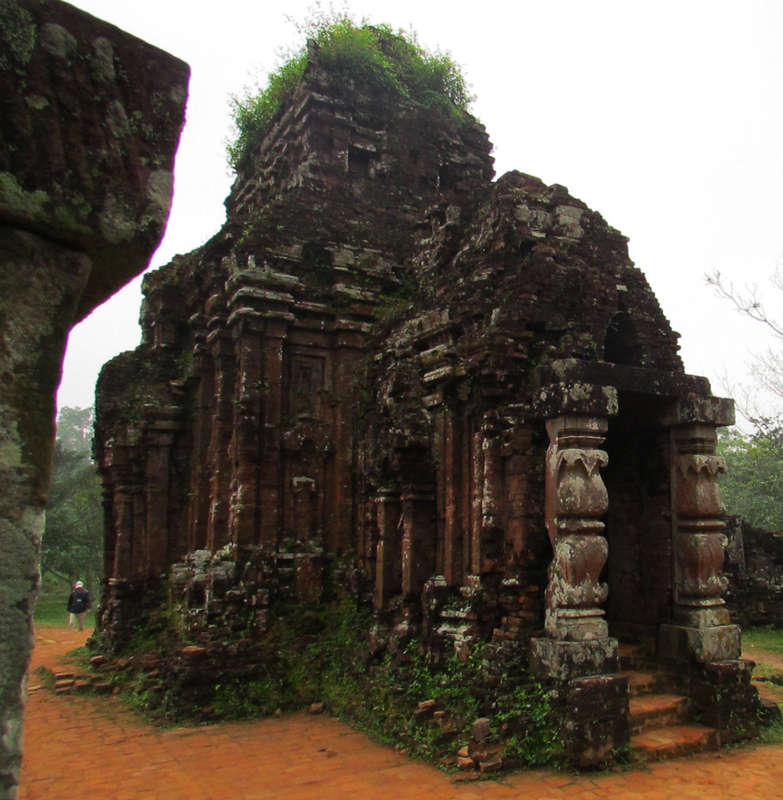 After our wander through the mist shrouded ruins we headed back to Danang to pack up and head to the train station. 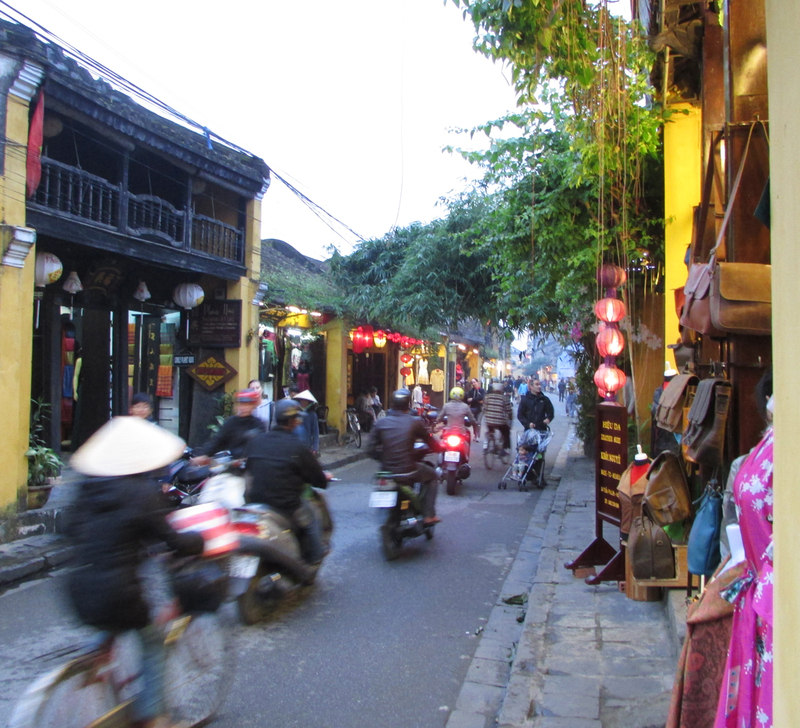 An easy two hour train ride and we arrived in the beautiful, 17th century port of Hoi An, another UNESCO World Heritage site. This calm city was full of amazing clothing shops in thick walled ancient buildings, that either made something special for you or tailored what they had – either way, beautiful work. We, went a bit crazy. Beyond the tailor shops, the city was full of mystery and stories on a slow moving river. Most of the buildings were painted with a golden mustard color, many with terraces. The narrow streets were inviting and around many a corner we would find yet another temple and always smiling, friendly people. 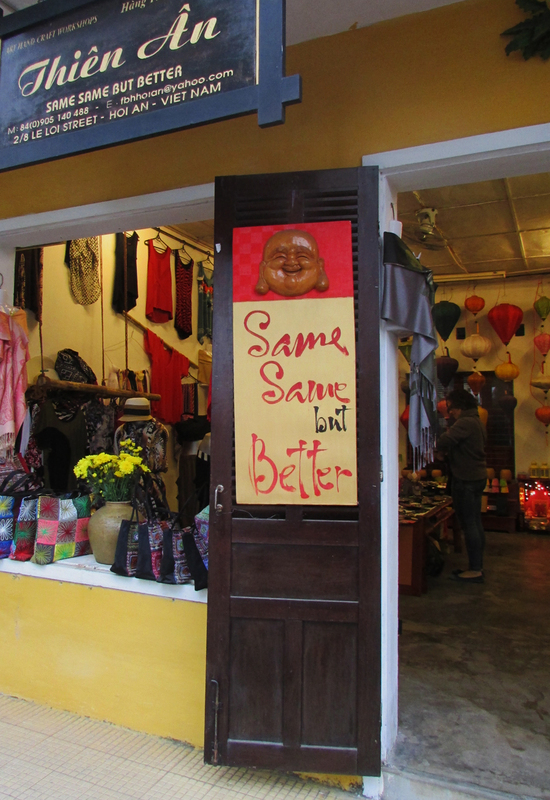 For those of you that have traveled in Asia you know that “Same Same” is a common refrain coming out the mouths of the locals. 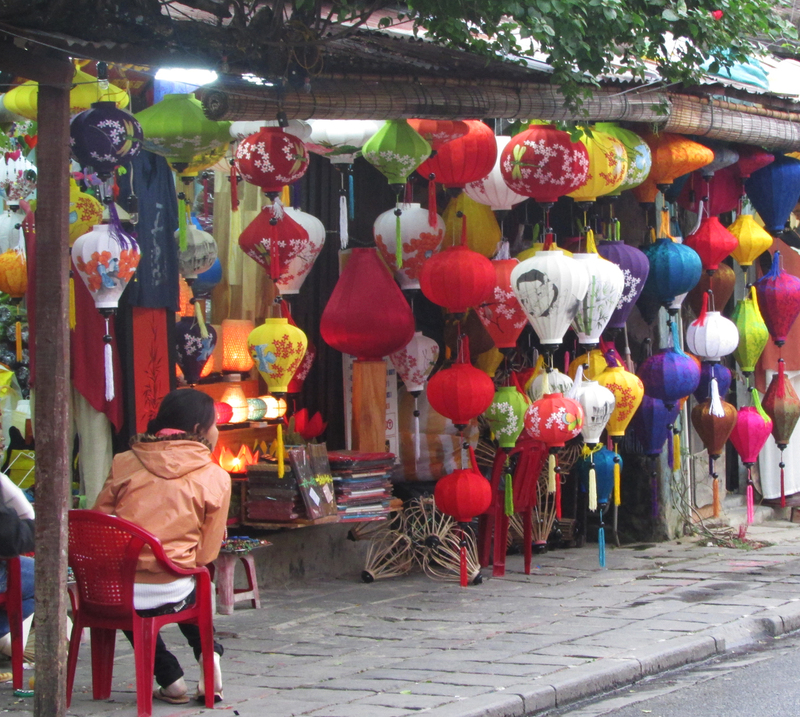 But this one topped that and became our groups daily mantra … Beautiful silk lanterns hung everywhere in the city. 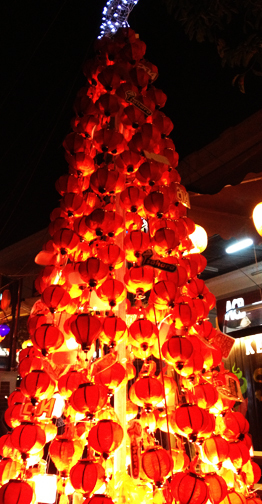 It was so tempting to buy one, but they weren’t exactly portable so… That evening we wandered the streets by lantern light and came across this Christmas tree made entirely of little, red lanterns. 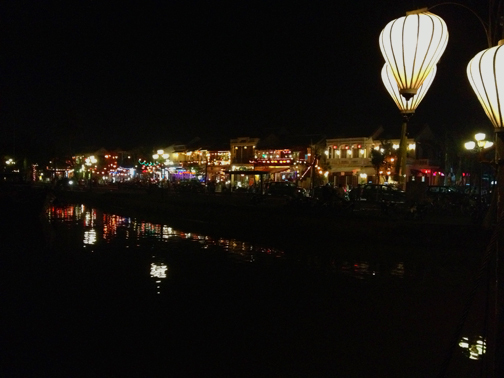 These floating lanterns were everywhere for sale. 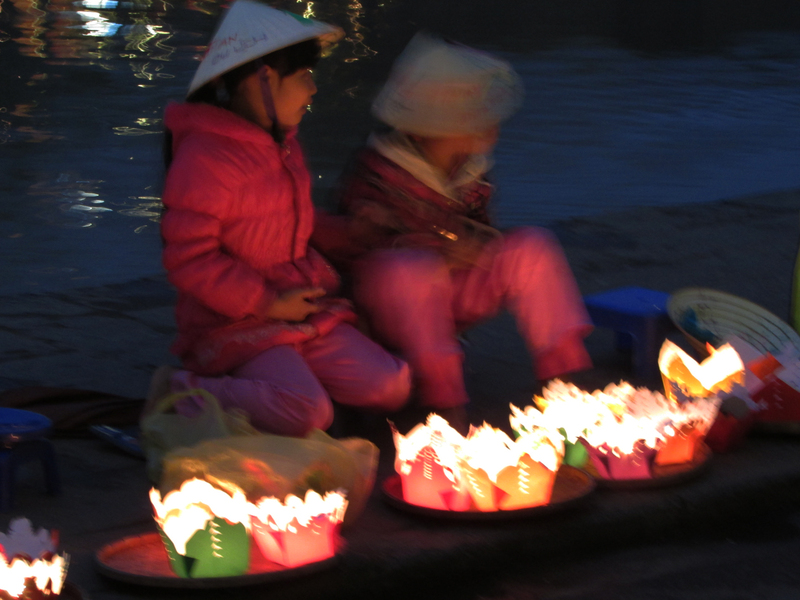 You buy one, lite the candle inside and place it into the river and make a wish/prayer. 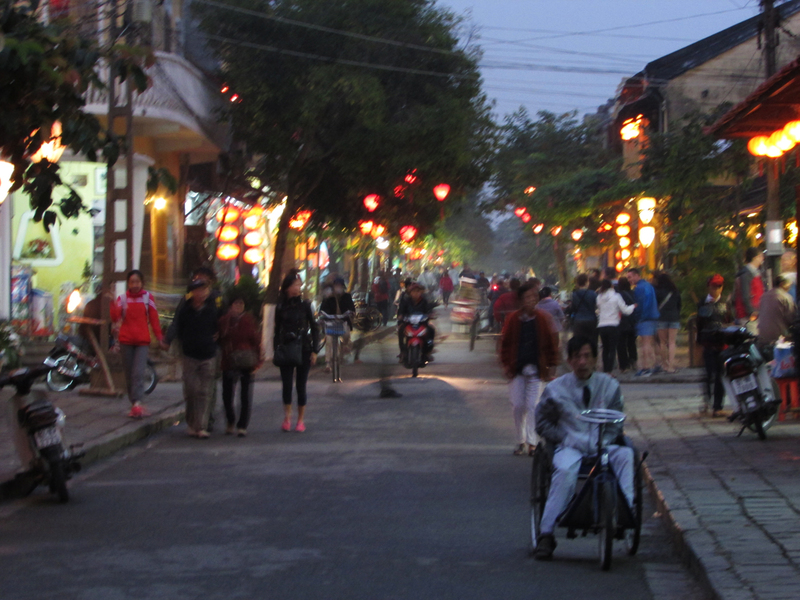 Then as you wander on down the street the vendors would scoop them back up and resell them. Quite the racket, but pretty none-the-less. 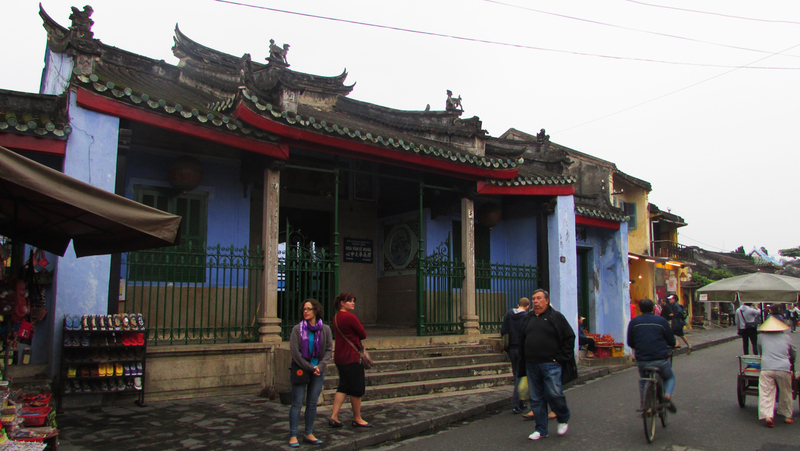 Next we headed to Hue (Way) to see the Forbidden Purple City. 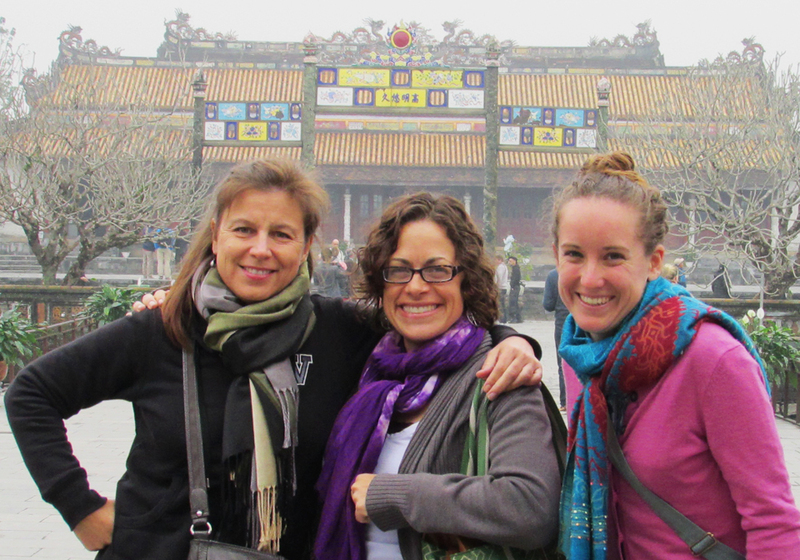 We never did discover why it was called the “purple” forbidden city and we never saw anything purple but there were some really pretty archways leading to lakes/ponds. It was a huge compound, all for the royal family. Gigantic copper pot. 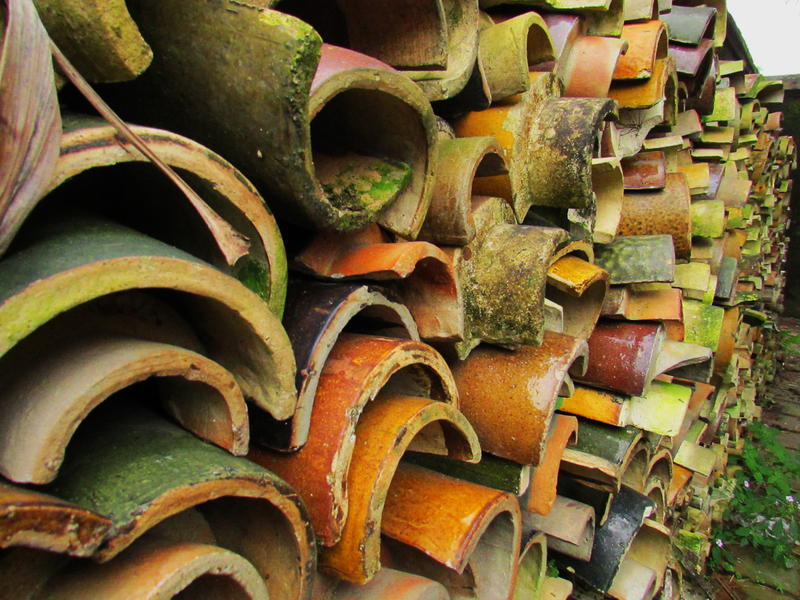 These are just a pile of roof tiles… I just love the color and texture they imbue. 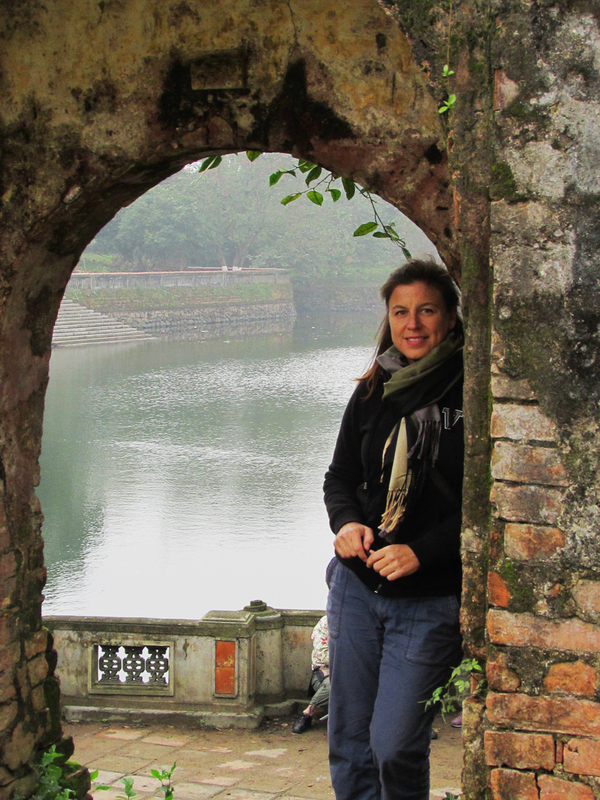 Time to say goodbye to Hue and head north. So…on to sleeper bus number three to Hanoi and Ha Long Bay. Stay tuned for part four, and I promise the conclusion. Beautiful! I would love to use that one photo of the red archway as one of my picture prompts! That would be great – just give my blog credit with a link. Thanks! Love reading along w. your travels. Simply fantastic Gretchen, thanks so much for sharing. The picture of you in the arch is a keeper! Well aren’t you sweet my dear. I hope all is well with Degrees of Transition. Looking forward to seeing you in early June sometime! I think Vietnam’s got deep influence from China ( in fact it was part of China long, long time ago), and the Chinese called their palace with the same name — 紫禁城(pronounced as zi-jin-cheng) — or Purple Forbidden City. Ancient Chinese believed the Heaven Emperor lives in a palace called ‘ zi-gond’ (meaning purple palace) among the Polaris stars and the emperor of China’s palace is the ‘zi-gong’ on earth, thus the purple, which actually has nothing to do with the colour. Forbidden is because it’s heavily guarded and ordinary people were impossible to enter. 🙂 I hope this solved the mystery! Great photos and great trip!! 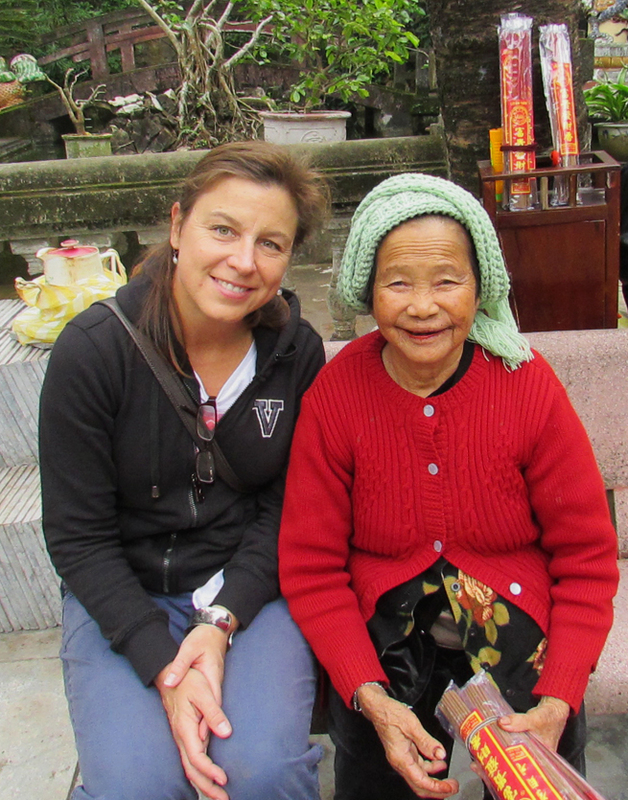 I wish I will have a chance to visit Vietnam in the future! Fantastic – thanks for the info!